The following is an 5-week, 31-session training plan designed to train specifically for improvement on the Alpinist Fitness Assessment. Alpine climbing objectives carry with them multiple fitness demands: basic endurance, mode-specific endurance for uphill hiking, under load, upper, lower and core strength, climbing-specific fitness and proficiency. Work capacity for short, intense, events, and stamina for long pushes. The 3.5-5 hour Alpinist Fitness Assessment assesses each of these fitness demands individually, and cumulatively. It is the most sport specific, demanding and comprehensive assessment of Alpine Climbing fitness in existence. You’ll complete the full Alpinist Fitness Assessment in Session 1 of this training plan. Your results will be used for the following training sessions and progressions in the training plan. In this way, this training plan automatically “scales” to your incoming fitness level. *** Note – Session 1 of this plan is the full assessment, and we are assuming an aspiring or veteran Alpinist interested in this training plan comes to it with a base level of fitness required to complete the assessment including the final 15K run. 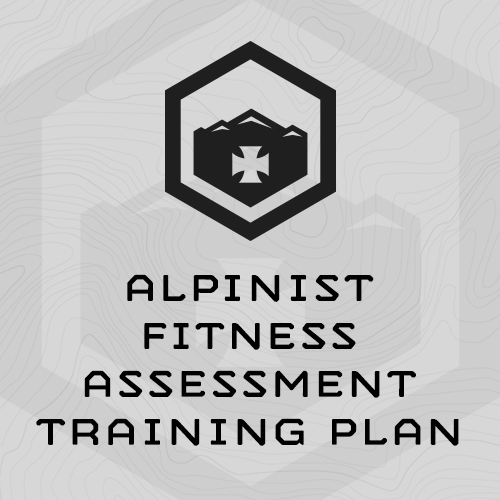 Session 31 of the training plan you’ll re-take the Alpinist Fitness Assessment and compare your results to Session 1. **Recommended: GPS watch for measuring distance and time for the running in the assessment and the training plan. To get your “Easy Pace for Longer Runs” enter your 15K finish time from the Alpinist Fitness Assessment into the Run Interval Calculator below. Example: Your 15K finish time was 1 hour, 12 minutes. According to the Run Interval Calculator, your ““Easy Pace for Longer Runs” is 05:46-06:07per km. Today, complete Part (2)’s 9km run between 51:54 and 54:56. (1) 5 Rounds, Every 75 Sec. (2) 5 Rounds, Every 75 Sec. 1) Divide your Alpinist Fitness Assessment Step Up Total by 4. 2) Multiply this Number by 1.2, and Round Down. 3) Result is the number of Step Ups you must complete every 10 minute interval above. In 50 minutes … Send 8 different boulder problems of increasing difficulty according to your ability. Add up the 8 highest V-numbers for your score. To get your “Per km Interval Pace” enter your 15K finish time from the Alpinist Fitness Assessment into the Run Interval Calculator below. Example: Your 15K finish time was 1 hour, 12 minutes. According to the Run Interval Calculator, you “Per km Interval Pace” is between 04:11 and 04:28. Today, you would run each 5K Interval at a pace between 20:55 and 22:20.